Since I moved to London six and a half years ago, my Sunday activities have changed somewhat. My first two years, when I was a young and spritely student, I spent my Sundays wallowing in self-pity after a heavy night on the tiles. The years since have pretty much been spent in the kitchen baking or cooking a Sunday feast. But despite being from the north (well, Nottingham), I rarely cook a Sunday roast. Don’t get me wrong, I have attempted a few but after five hours slogging away in the kitchen, not to forget the piles of washing up that come after, I have never really enjoyed the fruits of my own labour. I much prefer to go out and let someone else do the hard work for me. We took a trip to Victoria Park Village a few weeks ago to The Empress to indulge in a Sunday feast. The weather outside was miserable and as usual not making its mind up. We encountered a few showers before entering the restaurant but once we were seated, we were pleasantly surprised how bright and airy the restaurant was. If it wasn’t Sunday we would most likely have wanted to crack open a bottle of rose. First we were served with a plate of E5 bakery sour dough and butter. We learned quickly that if you order a plate of bread, you are entitled to free refills. A cleaver marketing ploy. We also ordered a plate of creamy green olives (£3) and deep fried polenta & salsa verde (£4.50) to start, followed by roast pork belly, roast potatoes & red cabbage (£13.50), cecina (£8.50) and a small portion of pearl barley, pea, feta & pine nut risotto (£6) for main. 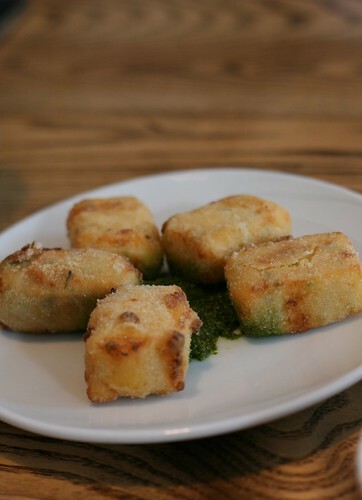 The deep fried polenta had a great crispy exterior and the salsa verde was a perfect addition to the creamy polenta inteior. My only criticism was that there was not enough of it and we were left with three plain pieces of polenta. 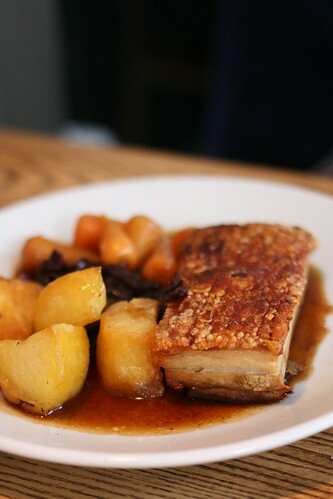 The pork belly arrived and I was happy to see a generous portion with a golden crispy topping. I tried to cut into it and despite having been given a sharp knife, it took a while to tear through the crackling. When I did, I took a bite of the fatty flesh, which was slightly dry but tasty nonetheless. The accompanying roast potatoes were fluffy and rich, the cabbage delicious with a hint of spice. 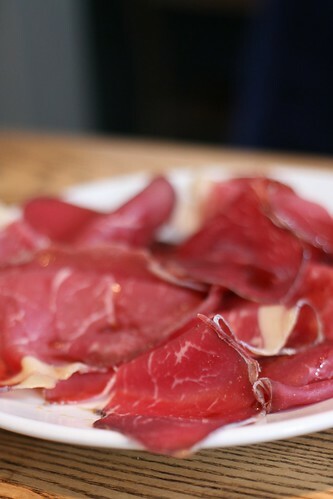 Our cecina was fantastic quality beef and was delicious with the E5 Bakery sour dough bread that we kept on ordering! One of the highlights of our lunch was the pearl barley risotto. 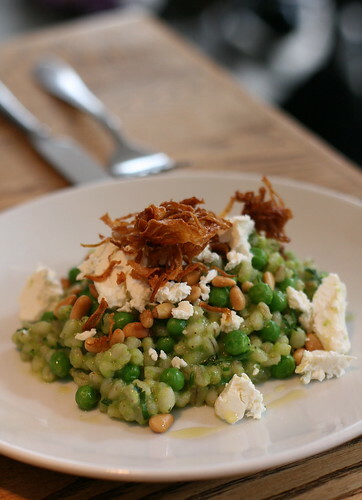 Nutty and al dente pearl barley with crunchy pine nuts, creamy feta and sweet peas was just heaven. I couldn’t go without dessert, particularly as the waiter walked past and recommended the baked cheesecake & orange (£5.50) when I was looking at the menu. I had to have it. Sadly (or not, which ever way you look at it), Jack doesn’t like orange so I had to eat it all by myself. It arrived and I tried to tell myself that I was not disappointed by the size of it. You see, it was quite small and I am quite greedy. 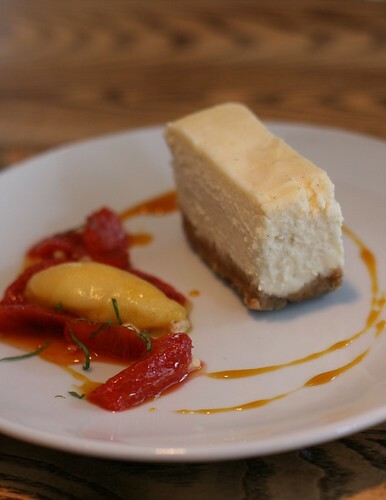 It turned out to be the perfect size and was quite possibly one of the best cheese cakes that I have ordered in a restaurant, that and the unforgettable cherry baked cheesecake that I had at Pizza East a while back. The atmosphere in The Empress is perfect for a lazy Sunday lunch time. Customers were a mixture of families, big groups of friends and couples. After our laid back lunch, we were off to have a quick walk around the village before jumping back on the train to reality. Food For Think was a guest at The Empress.